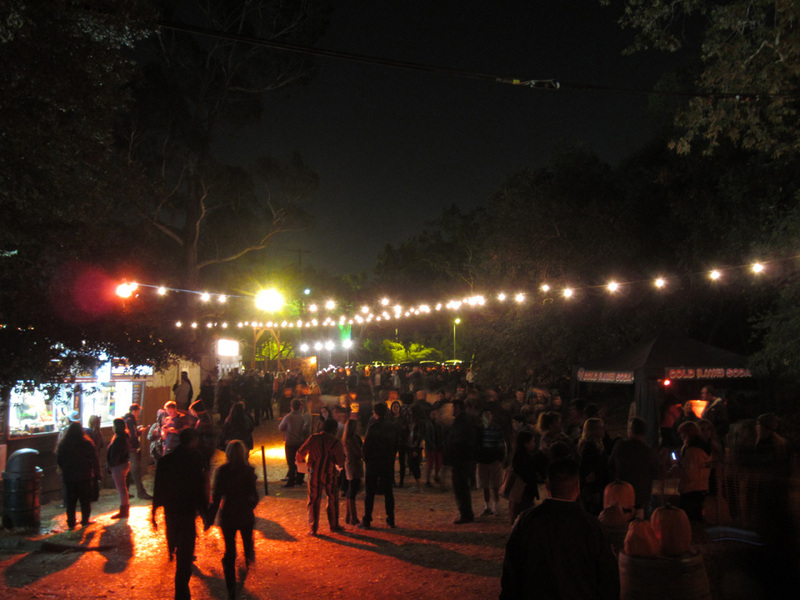 Although this is the fifth year of the Los Angeles Haunted Hayride, I hadn’t heard of it until now. 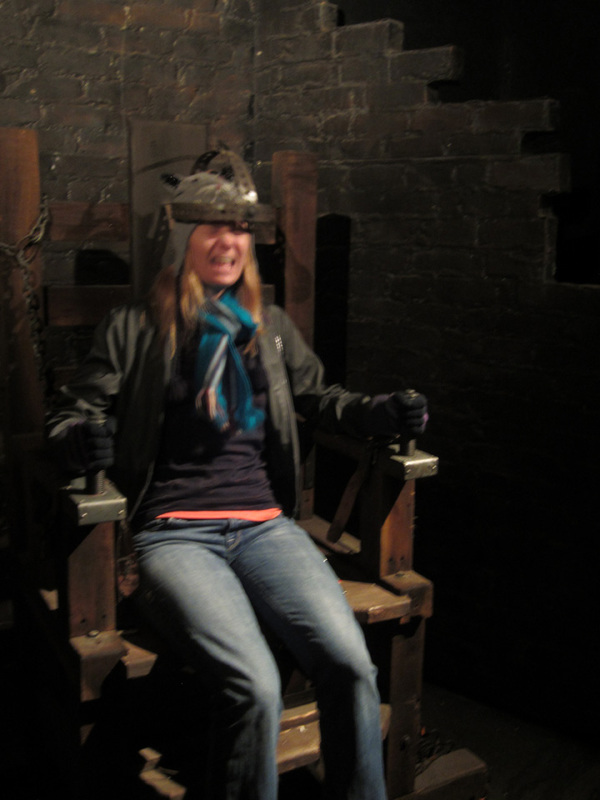 I’m glad I did though; it’s a worthy addition to the plethora of haunted attractions that spring up in October. The most unique thing about the Haunted Hayride is its setting. 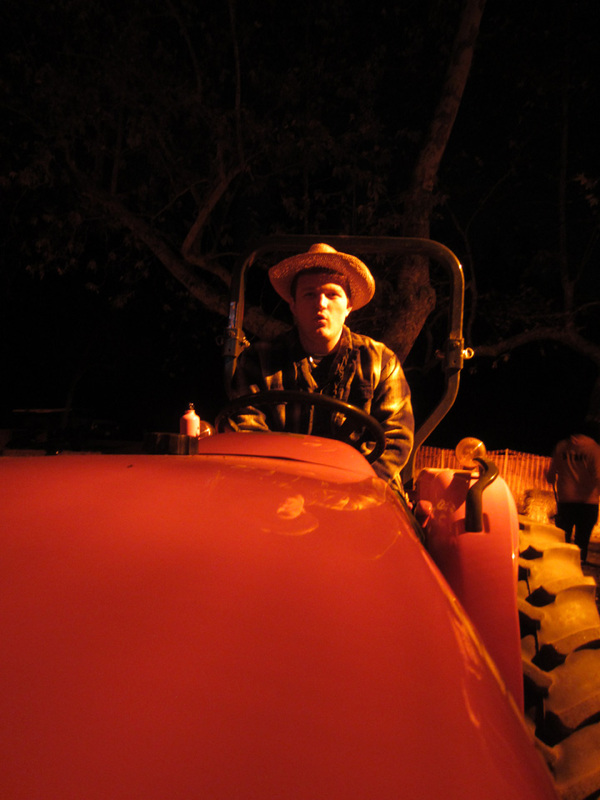 It’s entirely outdoors–a real hayride pulled by tractors that takes a 25-minute journey around the defunct Los Angeles Zoo in Griffith Park. The wide open spaces give the creators ample freedom to create some of the most elaborate sets and scenery I’ve ever seen for a seasonal attraction. 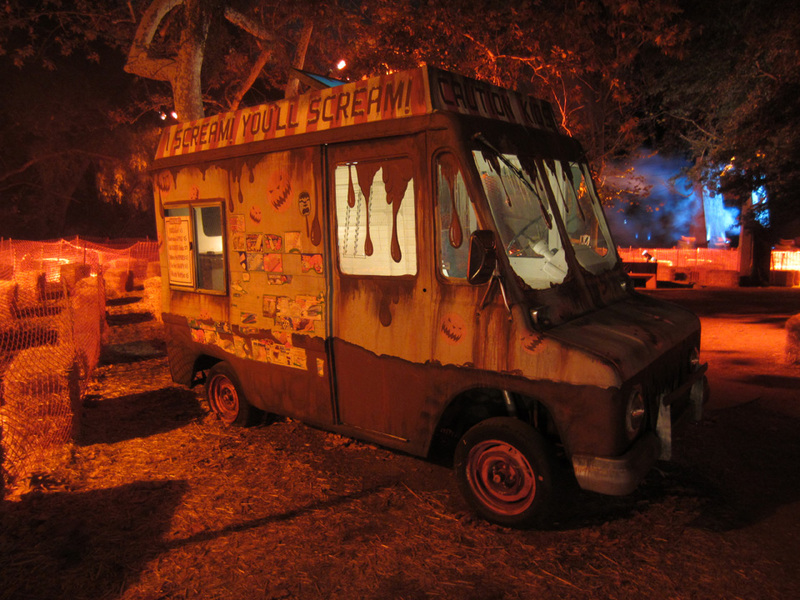 There are 8 or 9 different scare zones, depending on how you count. Each one is separate; there is no overall storyline here. The creators claim they are based on true events that happened in Los Angeles, but to me, the phrase “based on true events” is just a marketing ploy. 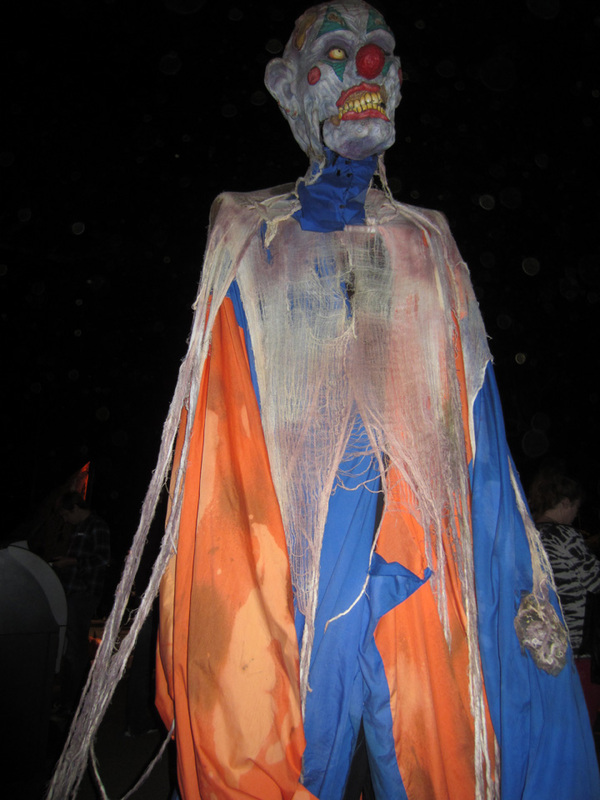 The scare zones are all of varying quality, with the most creative one being saved for last, as it should be. The trailer you sit on is a good idea, but I’m not sure it was utilized to the fullest. You sit around the edges facing inwards, so when all the scary stuff starts happening it leads to a lot of twisting your neck to see what’s going on. Plus, the performers aren’t allowed to touch you, as is customary with these attractions. This unfortunately means that they can only approach you from one side, so you can’t be surprised as easily. Most creatures resort to banging on the edges of the trailer for scares, but a few creative individuals did find ways to interact with riders in fun ways. The idea is good, and the sets show they certainly have resources, but I also think they could do more with the unique nature of the hayride. You’re on a fixed path–why not drag the riders through something that hangs down from above? Something they can’t avoid? More interaction, and less passive viewing, would really improve it. Luckily, there’s more! A more traditional dark maze called The In-Between. Again, there is some great innovation here but a couple flaws. The maze starts with an interactive video scene while you wait. I think it’s a minor addition, but a really good one. They release you into the maze in small groups, which is also a good thing. The maze inside is VERY dark. They give you a small red lantern, which is a nice touch. It’s only to keep tabs on your group though. It doesn’t provide enough light to see in the dark. That is provided by strobe lights that flash regularly enough to see for a split second before being plunged back into darkness. The effect is disorienting but a ton of fun. The maze is actually a maze too, which is awesome. Most of these have only one path to follow. This one has real dead ends. There are the usual costumed ghouls inside to scare you. This is where I found the maze lacking. It seemed I often came across a costume propped up against the wall with nobody in it. 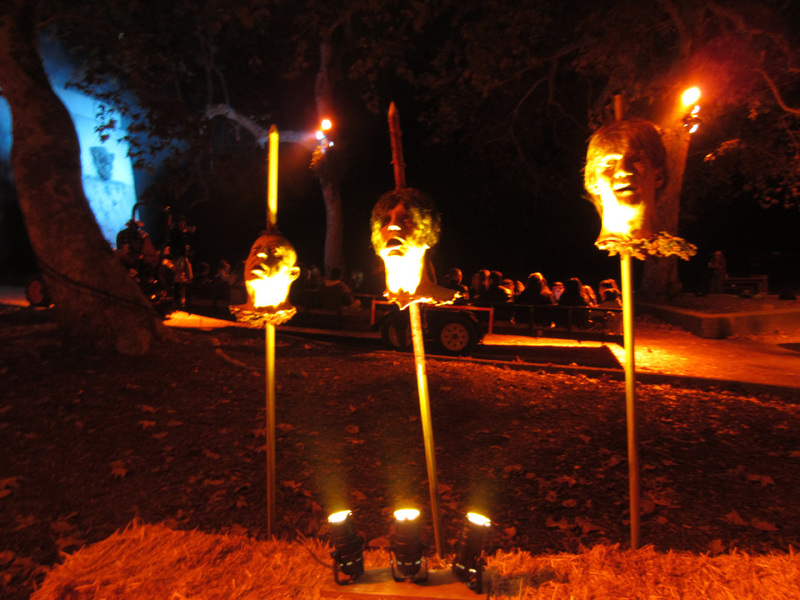 Or the scarers would kind of stand around and be creepy but not really try to scare you. There was nobody really popping out of dark corners. The final section of the maze also includes one of the best features–an inflatable tunnel where you have to push your way between walls that are closing around you. 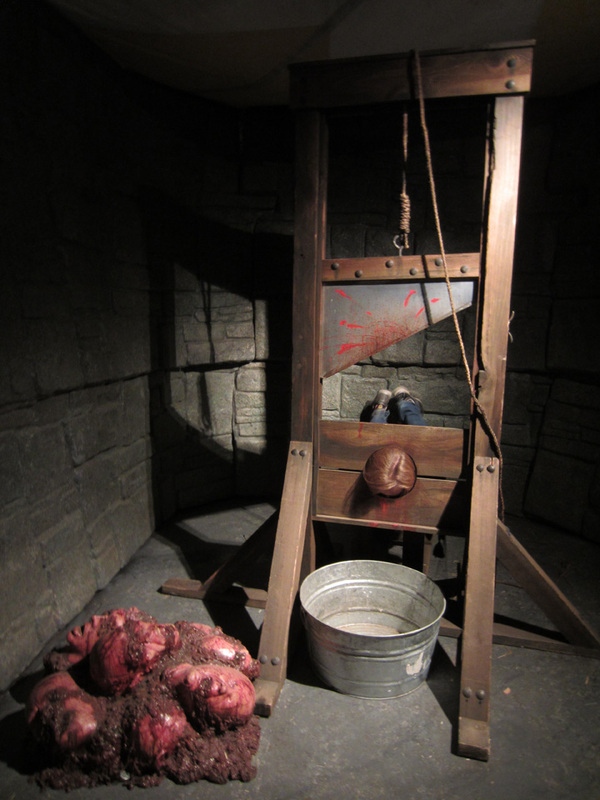 I think these should be standard in haunted mazes these days. They are really fun, especially if they find a way to add to the experience somehow. This one tried, and it was an ok surprise, but they can do better. Finally was Purgatory. This is an outdoor area between the maze and hayride. They have food and drinks for sale, of course, and a gift shop. 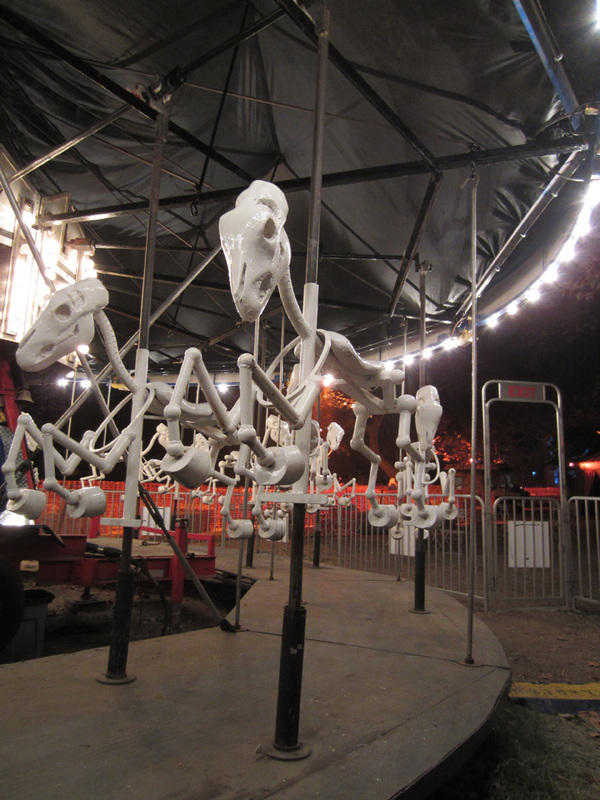 They also had fun stuff like a “Scary-Go-Round” with skeletal horses, a pumpkin patch and carving station, 3 fortune tellers, a small Hall of Mirrors, fun sets to take your picture in, a stage with speakers talking about “real” paranormal activity, and a stage that was presumably for a show but wasn’t active while I was there. This side area really adds a lot of value to the experience–it’s all included with your ticket price and is fun to walk around. I attended the preview night, which might explain a few little bumps, like why there was no stage show, why there were video screens that didn’t seem to show anything, and why the maze performers hadn’t figured out the optimal ways to scare people yet. On the plus side, we got short lines and did the Hayride twice and had the photo backdrops all to ourselves. If you’re a fan of haunted attractions, the unique setting of this one is enough to recommend it. I would suggest getting there early enough to not be in the longest line. I would also suggest doing the maze first. The hayride has enough capacity that even a long line there won’t take as long as the maze line. Hopefully they work out the little kinks and keep thinking of ways to improve! The website is www.losangeleshauntedhayride.com. They are open from 7 to midnight on Fridays and Saturdays and 7 to 10:30 on Sundays and Thursdays, plus Wednesday, 10/30. Prices are $30 for the hayride and sideshow, and an extra $9 for the maze. Some special discounts may apply; see the website for details.